Cash is king – such a cliché, but so true. Cash is the blood the feeds the organs of the organisation, however cash only follows results! If we have (real) profits the cash surpluses will lead to healthy positive cash balances. If on the other hand, our reported profits are not so real or worse still, losses, then cash balances will deplete. So far we haven’t told you anything you don’t already know – there is often a difference between real profit and reported profit. In our profit and loss account we only account for the interest on our loans as this is the cost of “buying” money. Paying the actual amount we borrowed back is not a cost, it is just repaying that which we received. VAT (Net Sales Tax) exists outside of our trading, profit and loss account. It is pretty much where our government free load on us to be their cash collector and when we cannot achieve their collection targets they impose many penalties and penal interest rates. We can have a super month in sales and yet no money. We offer our customers, (clients, guests, etc..) credit, which means of course that while we work or supply product today, we do not get paid today. Instead, we issue a sales invoice and account for this sale as a plus in our Profit & Loss Account. However, the “plus” will only come into our cash flow when we receive payment. “Hey we had a great month of sales, but when will we get paid?” – sound familiar? Of course, on the other side we buy the product(s) we are selling today, but we do not pay for them today. Yet the cost of the products we sell are taken into the Profit & Loss Account. (We will re-visit this topic from Credit Risk point of view later – for now I hope the timing differences are a little clearer and have helped to reconcile part of the difference between P&L and Cashflow. In order to run a business we will need items of a capital nature. For example, a restaurant will need to invest in a kitchen and all the equipment required for a commercial kitchen as well as the tables, chairs, the soft furnishings and the rest of the items (lighting) that are required to create the atmosphere. However, while we have to pay for these items of equipment now, the cost of these items only hits the P&L over a period of years via a depreciation journal. The reason for this is that these items will be of economic use for a period of greater than one year, or our average accounting period. Therefore, while we pay for this now our P&L only gets to see part of this cost each year over its deemed useful economic life. This is a very common place to see profits being swallowed up. Or worse, the debts you owe from better times. Legacy debt can come in many guises. Revenue debt, Bank debt, creditor debt. All are pretty unforgiving. Legacy debt is generally a result of a decline in the economic environment. And this decline can be rapid. As recently as 2008 Ireland saw its construction industry shut down overnight. This is, for a change, a positive cash effect that does not go near our P&L. This is an injection of cash either from a bank or from the owners. It can enter the business as a director loan (my preferred route) or an increase in owner’s equity. For the moment it is only important to understand that this will positively affect the cash flow while having no direct immediate effect on the P&L. Cash goes up, profit or loss does not move. It is a balance sheet item. 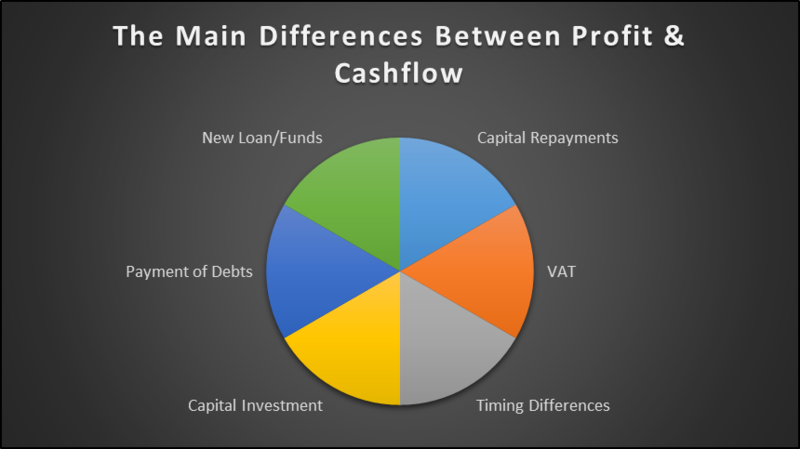 In order to better understand the impact all of these items have on the cashflow, we prepare a three month cashflow projection so as we can foresee any times when we might need a cash injection or even better, when we might have some extra cash to spend. This is a crucial tool which enables business owners to ensure smooth operations on a continuous basis – the last thing a business needs is suppliers cancelling orders or cancelling credit terms. Call us now on 01-4608090 to discuss how we can help you ….improve business.